I have a Hayward omnilogic control panel. It has the subpanel built in to it and it accepts up to 240 VAC at 125amp max. I'm planning on running a 220 line that would supply 80 amps to the panel. The run is 150ft including all bends. I'm not sure if I need to run 4 conducters at 6awg or 8 awg..... It will be buried in conduit. I tried using a wire gauge calculator and I'm showing that I need 3/0? Why 80 amps ? What are you doing out there that needs 80 amps? I would suggest that you lay the conduit 1" PVC and have the electrician select the wire size and maybe he could help determine load and the main breaker size. That is similar to what I come up with, though not guaranteed that my results are accurate. One question - do you really need 80 amps out there? With you listed loads, you could probably supply much less. There's no way anyone can answer your question without knowing the amperage of everything you are going to run out of the panel. Let's say you are going to max out 80 amps and you are going to use all 80 amps for more than 4 hours. Then you would need to run wire capable of handling 100 amps. To allow for a maximum of 3% voltage drop you can use #4 AWG for a 150' run. Run a 1" conduit like gwegan said. 3 #4's and a #8 ground. Thank you for the replies. Maybe 80 is more than I need. I just figure I would rather overdo it instead of underdoing it. I'm just running a 3 up variable pump, an omnilogic control panel, a saltwater generator and a couple of gfi outlets for misc things like a radio or chargers for phones. 40A would likely be plenty for you are looking to power and would need #6 wire pulled for that distance. If you're considering a heat pump, you need to provide the higher ampacity capability. 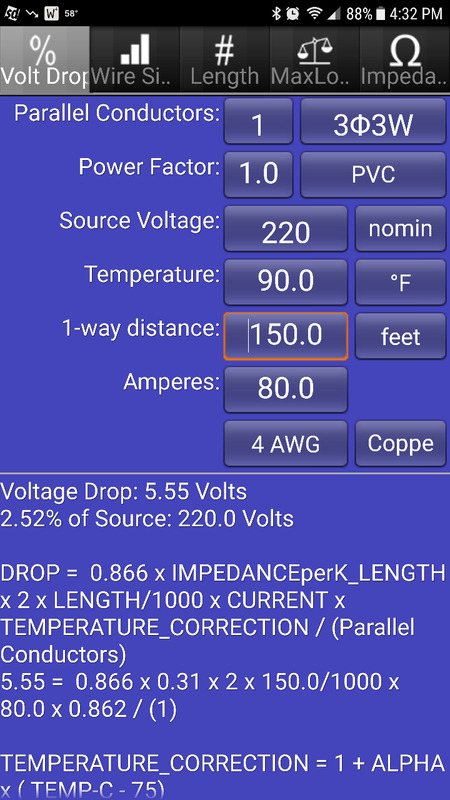 At 150 feet for <3% voltage drop on 80 amps, you want #3 copper or #1 aluminum. If it were me, id run 100 amps. If you ever wanted a heat pump, you'd need it. I'd never go through all that work of installing a sub panel out by a pool to run all the equipment with less than 100 amps. For 100 amps, you need #1 copper or 1/0 aluminum. Oh, and conduit size needs to be at least 1.5 " PVC, and I'd use 2"at that distance. You can also use #4 copper for the ground. Just wondering what formula you are using as i get copper #4's @ 150'. And if you use aluminum make sure you use penetrux. It's too keep the aluminum from corroding and it will. They are referring to the electric service to the panel, not from the panel to the equipment. It is fine to use aluminum wire for electric service to the panel. And not OK to use aluminum wire from the panel to fixtures. Not worth the headaches. You get to many problems down the road with aluminum. I'm biased because I'm an electrician 20 yrs and have seen it my whole career. The wire size also ends up being larger than copper for the same run so it becomes that much harder to pull. Suit yourselves. Its not my money. I'd run aluminum everyday and twice on Sunday's and never think twice. And yea, #4 copper would work on 80 amps. Id run the #3 if i were using copper, but that's just me. Depends on which temperature rating you want to use. If the termination lugs aren't marked, assume 60c. That would call for #3. Higher temp rating, sure, go with #4. But id never run less than #3 for 80 amps at that distance. Yup, that's what I'd have done.